A few months ago, 7-year-old Udaykarthik got sick with high fever, that lasted for about 20 days despite medication. His parents, Venkateswarlu and Gunji Devi were alarmed and decided to take him to a hospital. By this time, the glands near his throat had swollen up and his joints were hurting. Doctors at the Kanchi Kamakoti hospital diagnosed him with a type of blood cancer after running a few tests. 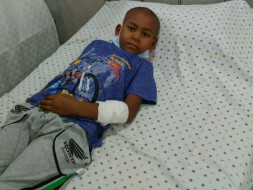 Now he needs a prolonged intensive medical attention and chemotherapy in order to get cured. Uday was like any other 7-year-old kid. He loved going to school and playing with his friends. At that young age, he didn’t even know he could fall this sick. What he and his family thought to be a bad fever turned out to be the worst thing that could happen to him. Ever since he’s been in the hospital, undergoing chemotherapy and enduring the uncomfortable and painful process. He still gets high fevers and sometimes his lymph nodes swell up causing him insufferable pain. Added to that, there’s the discomfort of chemotherapy. Sometimes he vomits and gets very irritable after his sessions. His parents can’t do anything but see him suffer through all this. Uday has an elder sister, Gayatri, who misses him terribly. The thought of telling them what actually happened to Uday breaks their heart. It’s extremely hard for them to tell them about cancer and that it can potentially take Uday away from them forever. Hence, they just told Uday and Gayatri that it’s bad blood infection he’s and that soon he’ll be fine and back to school. It is an extremely hard time for Uday and his family and they’re not leaving any stone unturned when it comes to his treatment. But the biggest hurdle they’re facing is lack of money. Venkateswarlu works as a teacher in a small government school near Sajjapuram village in Nellore district. His measly pay is barely enough to make ends meet for his family’s bare necessities, let alone affording his son’s treatment. He is trying his best to provide for Uday’s treatment. So far he has spent over Rs 8 lakhs towards various tests, medical procedures and medication. For this, he’s had to sell all of his wife’s jewellery and also had to borrow money from his friends and relatives. Now he’s run out of that money and needs your help to save his son. Uday doesn’t deserve to die because of his father’s financial condition. 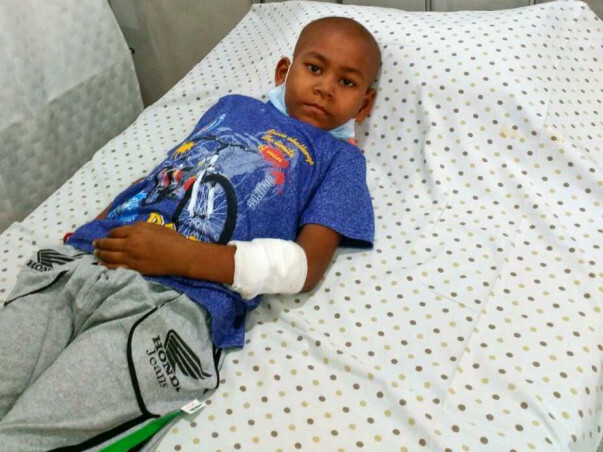 Your contribution can give this young boy a second shot at life. With a heavy heart I regret to inform you that Uday is no more. He was being treated at home with medicines as his cancer had relapsed despite the chemotherapy. Due to the relapse, the disease took his life. He was discharged from the hospital 2 weeks back. We will post an update regarding the utilization of funds soon. Please pray for his soul to rest in peace. 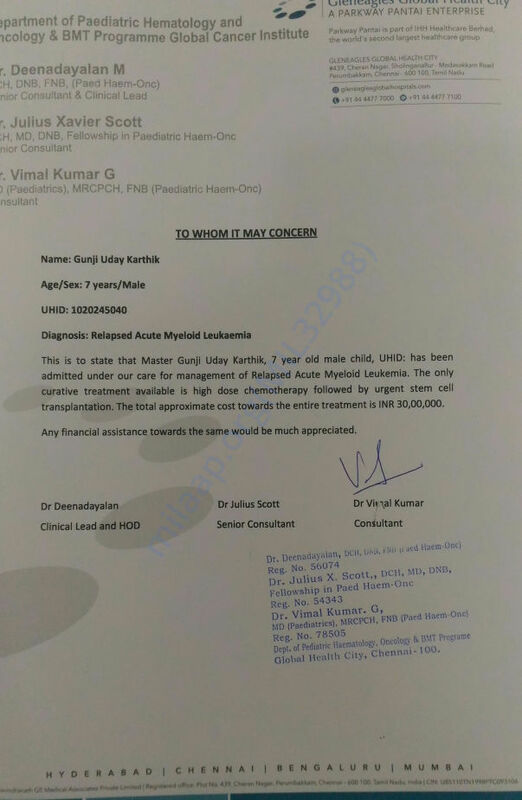 Uday Karthik is currently recovering from high dose chemotherapy that needs to be given to enable him for Bone marrow transplant. In the same process, he developed a lung infection but the doctors did their best and he is recovering from it gradually. Thank you all for your support and love which you have shown towards him. it's still a long road ahead of us, kindly pray for him and please share this campaign among your family and friends.